One of Europe's fastest growing low-cost airlines, Wizz Air, recently confirmed it was adding another Airbus A320 aircraft to its base at Kutaisi, the third one to be based there. The airline also announced that it was adding six new routes from the city, which are Eindhoven, Bari, Copenhagen, Basel-Mulhouse-Freiburg, Tallinn and Brussels-Charleroi. WIZZ started operations from Kutaisi International Airport in 2012 and after 7 years of successful operations, and only 8 months after allocating its second aircraft to the Kutaisi base, the airline announced the further expansion at its Georgian base by allocating a third Airbus A320 aircraft in August 2019. The new aircraft represents another $101 million investment into the Georgian aviation market and will contribute to the creation of over thirty new direct jobs with Wizz Air. Johan Eidhagen, Chief Marketing Officer of Wizz Air announced the start of six new routes commencing on 1 August 2019, together with which WIZZ offers now 27 routes to 18 countries. WIZZ, the pioneer of low-fare air travel across Europe and in Georgia, is continuously expanding its network by bringing affordable travel opportunities combined with great on onboard service between Kutaisi and the rest of Europe. In 2018 the airline has carried 643,000 passengers on its Georgian routes, representing an 88% year on year growth. The six new routes announced today will bring an additional 98,000 seat capacity to the airline’s Georgian network, totalling over one million seats on sale in 2019. 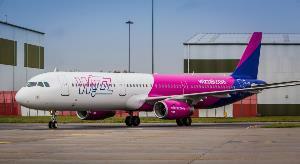 “Wizz Air, Georgia’s number one low-cost airline, continues its strong growth and creates ever more opportunities for its travellers to discover Europe and beyond at the lowest fares. Today we announced new investments in our Kutaisi base, by allocating a third Airbus A320 in August 2019. In addition, WIZZ network from Kutaisi will be diversified with 6 long-awaited routes to the Netherlands, Italy, Denmark, France, Estonia and Belgium. Our continuous growth in Kutaisi further strengthens Wizz Air’s commitment to Georgia, the city and the airport of Kutaisi, as well as stimulate the tourism and hospitality sectors in Georgia. We are now offering 27 routes to 18 countries from Kutaisi. We welcome all eager travellers to discover these and other great European destinations while enjoying WIZZ’s low fares and great onboard experience” said Johan Eidhagen, Chief Marketing Officer of Wizz Air.